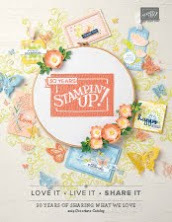 Today I arrived in San Antonio for Stampin' Up! On Stage. 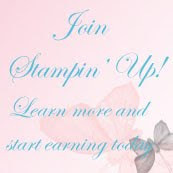 This is one of the 6 different swap cards I created for swapping cards with other Stampin' Up! Demonstrators . I usually create cards with multiple die cuts, layers and accessories for many of my organized swaps. However, I like to create a simple card for general swaps. And this card really fit the bill. Today's card again uses the Petal Promenade Designer Series Paper, one of my favorites since it was introduced in the Stampin' Up! annual catalog almost one year ago. It can be dressed up with coordinating ribbons and Beautifully Detailed Laser-Cut Papers. Or it stands as its own focal point. I love how nice a simple card looks. The basecard for today's card is Fresh Fig. Then a layer of Smoky Slate, and then a layer of Petal Promenade Designer Series Paper. I used two different sentiments from the Humming Along stamp set for my two different cards below. They are stamped in Tuxedo Black Ink onto Whisper White cardstock and then punched with the Tailored Tag punch. Then I tied a 1/4" Rich Razzleberry Velvet Ribbon into a knot and added it under the sentiment layer, which is popped up on Dimensionals. Because the ribbon is one-sided, you do need to twist the ribbon ends slightly to ensure the velvet side is showing. I'm getting my new catalog mailing list set up this month. If you've purchased from me in the past 6 months, you'll be on the my list to receive a new catalog in late May. 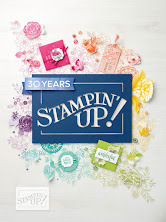 If you haven't purchased and don't have a current Stampin' Up! demonstrator, I would love to be your demonstrator. 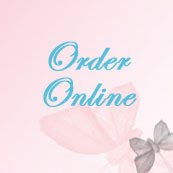 Contact me, so I can add you to my new catalog mailing list. You can purchase the items used on this card by visiting my online store here. To see more about each product, click on the product below.